On a recent trip to Israel, I came home with so much fresh tahini that customs actually stopped to inspect my luggage. The trick to this five-ingredient recipe is using the best yogurt and tahini you can find - you’ll soon find yourself drizzling the Tahini Yogurt over everything in sight. This vegetarian Mediterranean dish is sure to take your weeknight meals to a whole new level! Stir lemon juice instead of water into your tahini yogurt for a zippy flavor boost. You could even add this dish into your Thanksgiving side dish line-up for an interesting twist on traditional holiday recipes! Per Serving: 110 calories; 6g fat; 12.4g carbohydrates; 2g protein; 1mg cholesterol; 462mg sodium. yum! this is such an interesting, cool way to prepare sweet potatoes. i love tahini and am always looking for more recipes! this tahini yogurt sauce is delicious. I tried making this dish and it was so easy! I also really enjoyed the tahini yogurt. I used lemon juice instead of water, it was delicious! 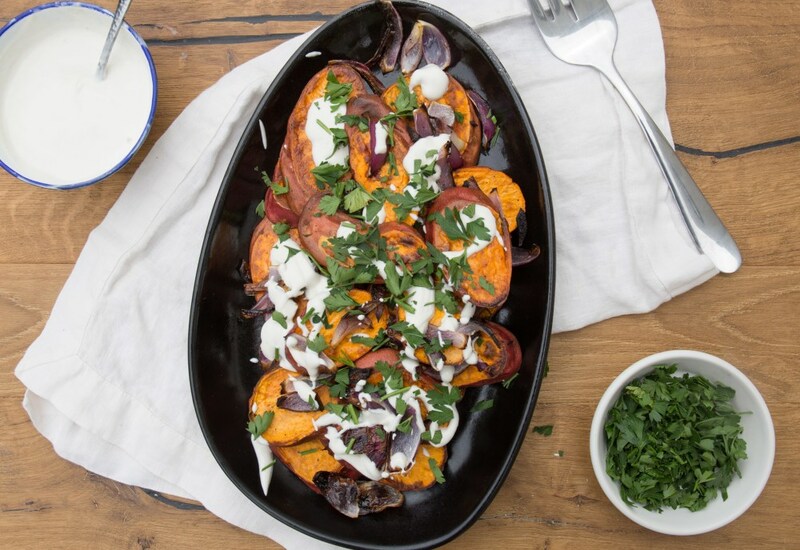 I love how versatile sweet potatoes are, this is now truly a favorite.